When a moment of magic presents itself to ten-year-old Chin it is good that he has Eagle, his talking dog, to turn to for guidance. The magic leads Chin and his canine companion to encounter dark forces lurking beneath their quiet and otherwise uneventful town. Ultimately Chin learns to trust himself and his own powers, taking on the challenges that he faces with pluck, resolve, and a loyal friend at his side. This story is a fun adventure and a wonderful read for any child who is taking their first steps into the fantasy genre. Through this delightful tale children can learn that if they trust themselves, visualize positive outcomes, and keep a positive attitude the results can be most unexpected, positive, and satisfying. User reviews at Amazon.com: "It is a fantastic adventure that keeps kids engaged but it communicates a powerful message about having a positive attitude towards life" - "I enjoyed this book, even as an adult" - "Positive thinking and self reliance...". 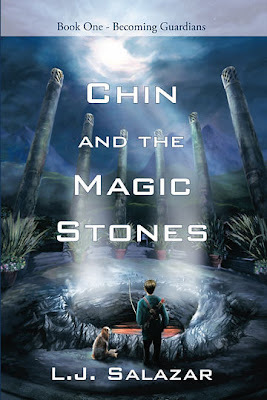 "Chin and the Magic Stones is a charming adventure story for young readers who will enjoy learning, along with Chin and his companions, how positive thinking and a mind open to magic can lead you to some unexpected challenges and rewards." "Chin and the Magic Stones is an electrifying tale of a young boy who is able to overcome fears and insecurities through belief in himself. With the help of his companion dog "Eagle", Chin is able to provide hope and help to his friends by combating the evil of negative thinking. This story is engaging and suspenseful, educational and whimsical.... "